You can install the Jamf Self Service for iOS app or the Self Service web clip automatically on all managed mobile devices using the Self Service settings in Jamf Pro. By default, the Self Service app is installed on all managed mobile devices with iOS 7 or later except Apple TV devices and personally owned devices. The latest version of the Self Service app available in the App Store requires devices with iOS 10 or later. Note: If you have upgraded from Jamf Pro 9.3x or earlier, the Self Service web clip remains installed on all managed mobile devices. Self Service can run on mobile devices with iOS 7 or later that are managed by Jamf Pro 9.4 or later. Note: For manual installations, devices with iOS 11 or later must use Self Service 9.101.0 or later. Earlier versions of Self Service will not work on devices with iOS 11 or later. To install the app, choose “Self Service app”. Note: The Self Service app requires mobile devices with iOS 7 or later. For earlier iOS versions, the web clip is installed by default. To install the web clip, choose “Self Service web clip”. If you do not want to automatically install Self Service on all managed mobile devices, choose “Neither (manual installation)”. For more information, see the Manually Deploying Jamf Self Service for iOS and Customizing the Self Service Web Clip Icon Knowledge Base articles . Configure the settings on the pane. Users are prompted to install the app from the App Store the next time the device checks in with Jamf Pro. Users are also prompted to install the app from the App Store on mobile devices as they are newly enrolled. 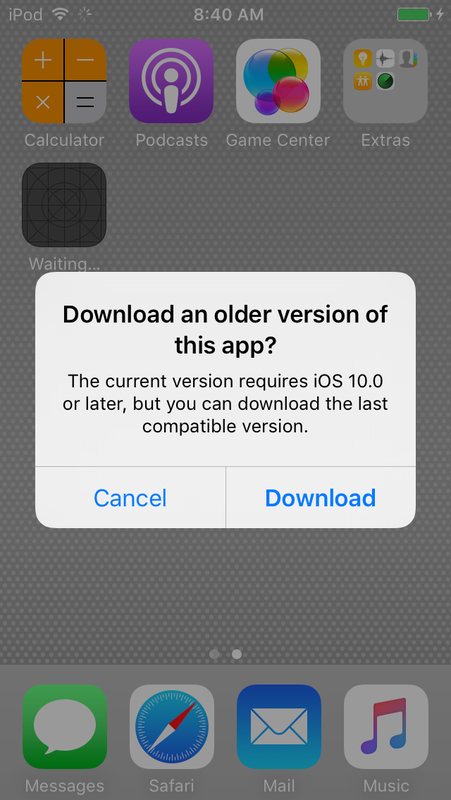 On devices with iOS 9.x or earlier, users are prompted to download an older version of the Self Service app. The user must tap Download to install the last compatible version of the Self Service app. For more information on the Self Service levels of compatibility, see Requirements. Learn about Jamf Self Service for iOS. Learn about the Self Service web clip.